What is PEP Cloud Estimating Software? PEP Cloud was developed in 1996 to simplify the operations of a leading painting company in Southern New England. PEP Cloud has grown into an industry leader in painting estimating software, training on using the software program, and a full suite of tools to manage and operate a painting business. The PEP Cloud software is available as a mobile application; a Windows based multi-user platform, and an introduction version for new users. PEP creates a mobile office when used with a tablet or laptop while on the jobsite. Estimating is a difficult but mandatory part of your painting business. With so many different ways to estimate and so many factors to consider, it can be overwhelming. Fortunately, PEP Cloud estimating software can provide you with the guidance you need to feel more confident in what you quote to your potential customers. It provides you something more reliable than a spreadsheet, but still gives you the ability to customize your estimates. While there are many reasons to use PEP Cloud estimating software to get the job done right, here are three of the highlights that make it an easy decision. Naturally you want your clients to be happy, but ultimately your estimates need to ensure that you make a profit. If your estimates are too low and you end up going well over your quoted price, you end up costing your business money. When you first provide an estimate to the client, you want it to be as close to the actual cost as possible. Of course, the more complicated a job is, the higher the cost, and that could result in losing a potential client because they feel that you are too expensive. PEP cloud estimating software gives you the ability to show your clients how you arrived at the estimated cost. This lets them look it over and see what you cost for the different elements, like number of layers, type of paint, surface area, and complications. They can decide if they want to make changes to the estimate so that they can use your services. For example, they may decide to lessen the job scope to stay within their budget. This means you are more likely to be hired because people can see the quality and details they are getting for the price. One of best aspects of PEP Cloud program is that it retains the data from every estimate you enter. When you start a new estimate, the estimate works off of previous estimates to help reduce the amount of time it takes to create a new estimate. This is particularly important when it comes to reducing the amount of time it takes to bid on a job. Bids are a long and drawn out process that is not guaranteed to pay off. With PEP cloud, you have the necessary tools to more quickly complete a bid without sacrificing accuracy. It is nearly impossible to accomplish anything today without being almost 100% mobile. With PEP cloud estimating software, you don’t have to loss potential clients or bids because you couldn’t get back to your office fast enough. If you need to make a few adjustments and resubmit a bid, you can do it from your tablet while you are away from your desk. Whether you are at your desk or at a job, you have access to the same information, making it easier to provide existing and potential clients with the service they need. PEP, LLC presents PEP Cloud and PEP Cloud PRO as the leading edge estimating and business management cloud-based software program designed by a painter, for painting contractors. PEP Cloud is a strategic business tool that guides you in constructing a professional, legally binding proposal and contract for your clients which is quickly and easily delivered electronically for the convenience of all parties. PEP Cloud PRO, is designed to aid you in keeping your business organized, allowing you to easily track your jobs and clients, manage your employees, and correctly calculate your fees and expenses of all jobs, so you can achieve consistently the profitability you require. PEP Cloud and PEP Cloud PRO will help take your business to the next level and demonstrate the professionalism you desire for your company. 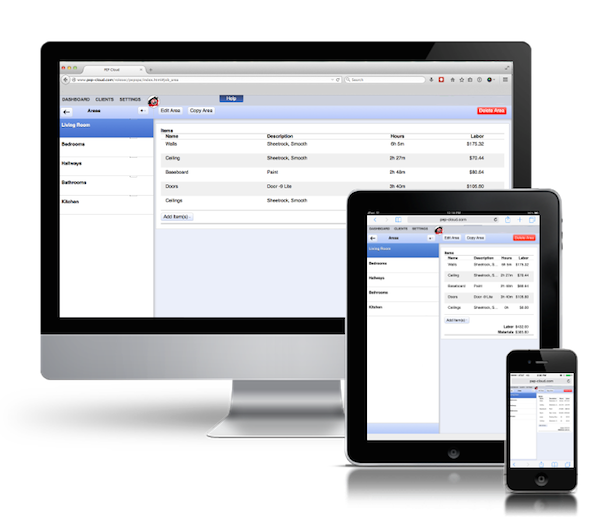 Call us to schedule a demonstration of PEP Cloud and PEP Cloud PRO painting management software or sign up here to show you why PEP Cloud Estimating Software is the answer to managing and operating your painting business profitably.